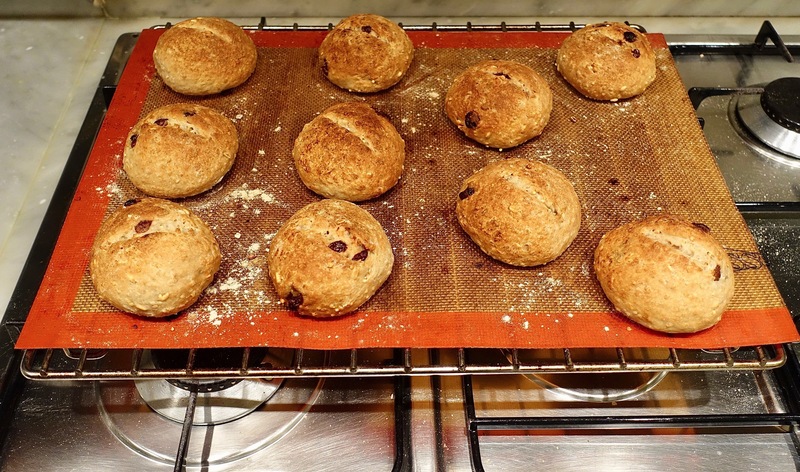 Yesterday, I made these stunning delicious sourdough bread rolls! I had 3 types of flours lying around that I needed to use up. It is an adapted recipe from myself. Take Kenwood major & place dough hook in. In the fitted bowl, add all ingredients & begin to mix it all in on low-speed aka number 2 for 3 minutes. Then, turn speed up to number 4 & knead dough for another 5 minutes. Take dough out of the bowl with help of a dough scraper. The dough will stick a bit but that is normal. Knead the dough by hand for another 2 minutes. 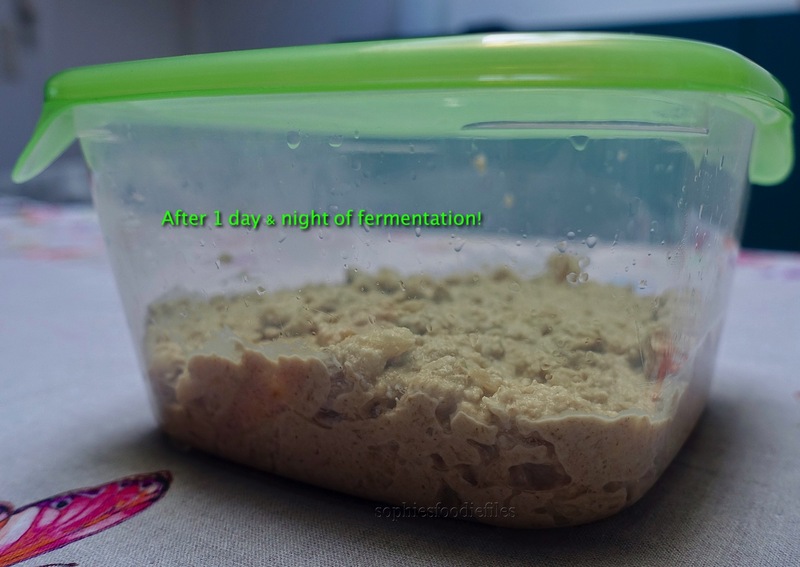 I did the stretch & fold method a few times to strengthen the gluten within! I place a bread Silpat onto an oven rack. Weigh the dough. Mine was 1008 gr. I wanted to make 10 bread rolls so each roll weighted about 100 gr. Make them not too big because they will rise for about 6 hours & will get bigger! This is how I formed them. With dough scraper, divide the dough into 10 pieces, each weighing about 100 gr. Weigh them & form a round ball. Flatten each piece with your hand palm. Now, pull top side up & then fold it back into the middle of the dough piece. Then, pull the left side out & pull it back into the middle of the dough. Now, the bottom side, pull it & fold it back into the middle of the dough piece. Finally, pull the right side up & fold it back into the middle of the dough piece. This is all to stretchen the gluten within! Now, roll your bread roll into a round ball shape & with help of your fingers & hand, shape it all round, also on the base! 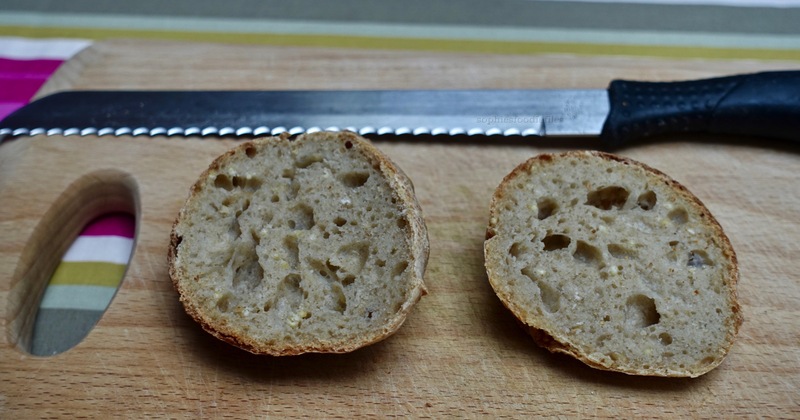 Place each bread ball, spaced apart onto the bread Silpat. Scatter some of that 5 grain flour on top of each bread ball & place into a closed plastic bag in a warm place (like 21-22°C) to rise for 6 hours! They all will slowly rise! When ready to bake, preheat oven to 220°C (428 F) for 10 minutes. After that, score your bread top, like the pattern you want. 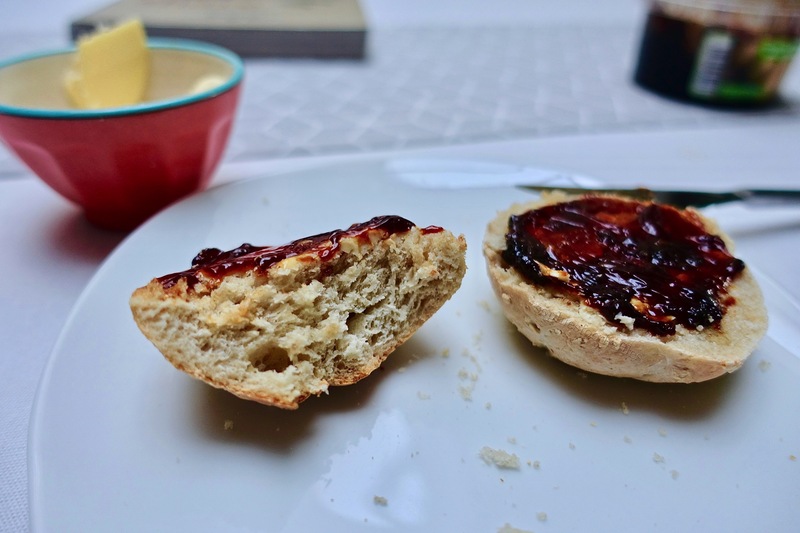 Smear the top & sides of each bread roll in with water. Lower the heat of the oven to 180°C (356 F) & bake for about 30-35 minutes. When ready, bread rolls are browned & risen. Tap on the bottom to see if they are baked through. If they sounds hollow, they are fully baked! Insert a thermometer & if the inside is 95°C & more, it is fully baked! Place onto a wire rack, to cool down completely. When ready, eat with a big smile on your face! 🙂 Yummy Yum! They won’t last for 2 days! 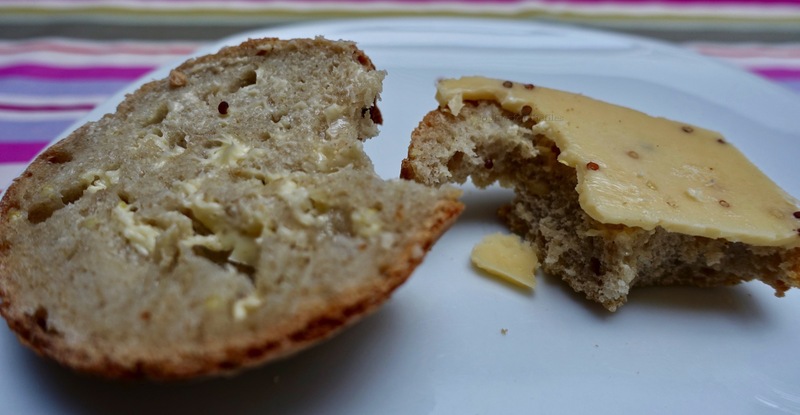 Delicious with butter & cheese with mustard seeds! Ready to rise for 6 hours! Vegan Sourdough Chocolate Chip Almond Buns! 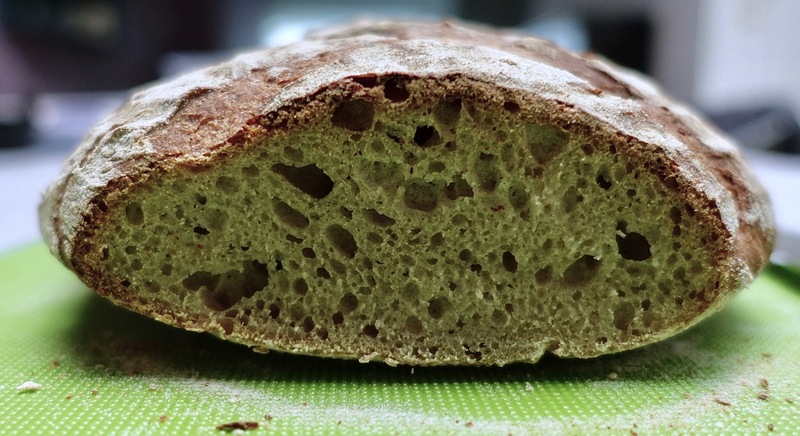 Sourdough Rye Bread! A thing of beauty! 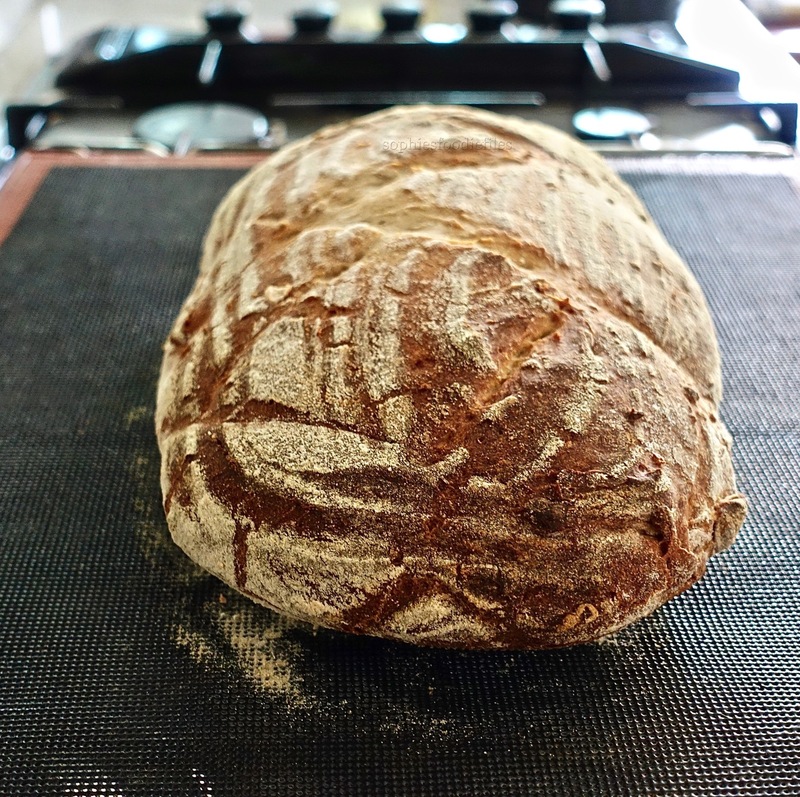 Yesterday, I made this delicious rye sourdough bread! A thing of beauty! I also used my own rye sourdough. My bread came fresh out of the oven & it weighted 919 gr! Ooh yes! 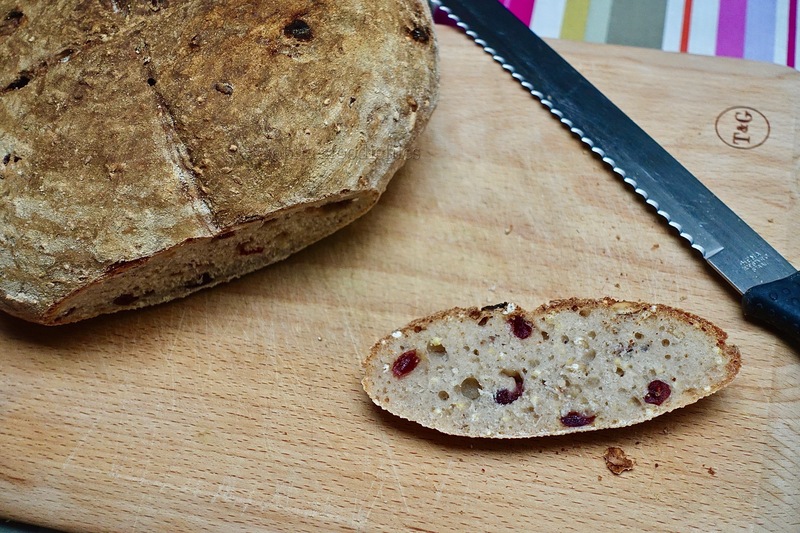 My rye sourdough bread was a bit more tangy, that typical sourdough flavour! I think it is because my rye sourdough has aged well. With my first 10 sourdough breads, the tangy flavour wasn’t really there but now, when every sourdough is maturing well, it becomes more sour & that is the way, my hubby Peter & I like it! 🙂 The rye flavour gives it more depth & flavour too! Perfect with butter & cheese, I say or with a slice of good smoked Spanish ham! Now, let’s make this recipe! 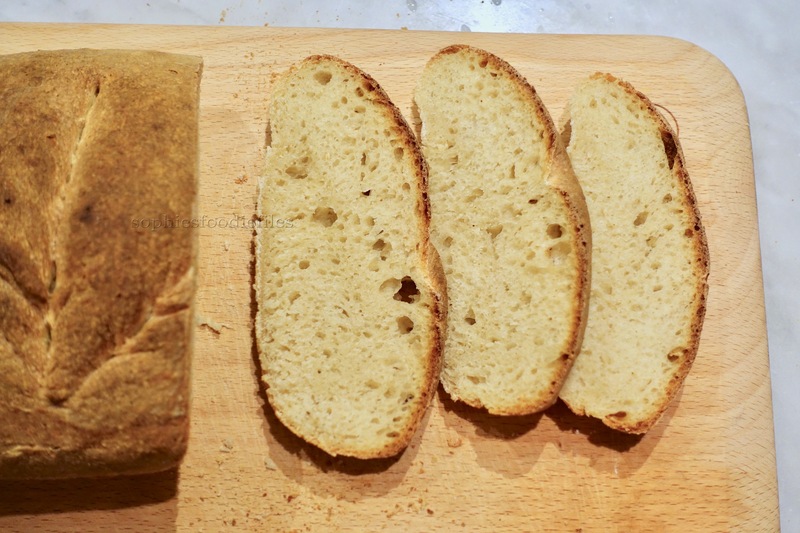 Recipe: For 1 large bread of 919 gr! Take Kenwood machine & place dough hook in. 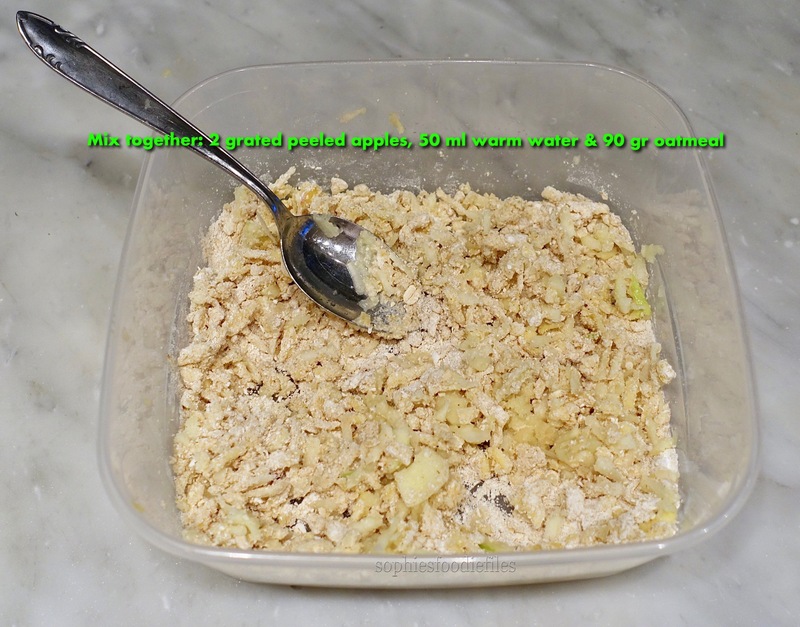 Add all ingredients in this order into your fitted bowl & turn power on & knead the mix onto low-speed. I put it onto number 2 for 7 minutes. Stop machine from time to time to scrape the sides. 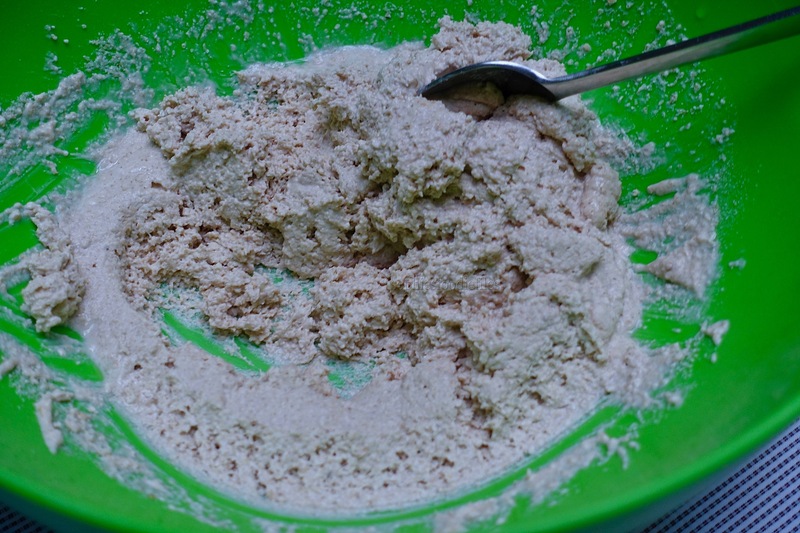 Then, with dough scraper, scrape dough out of the bowl & flour your kitchen counter a bit with T 65 flour & your hands too, to prevent sticking! 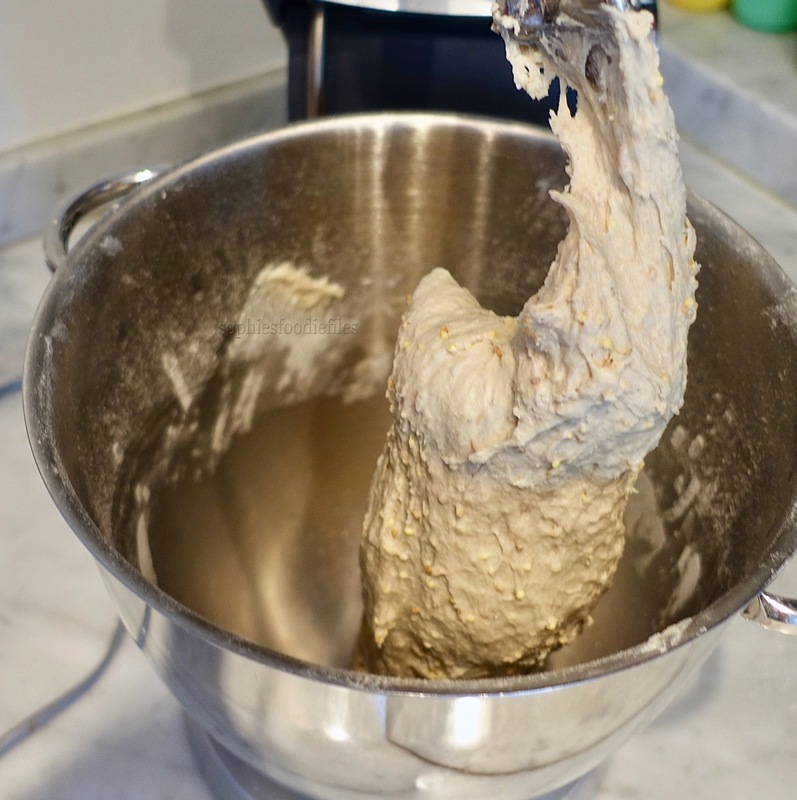 Knead the dough with a few stretch & folds to strengthen the gluten within! The dough is very wet!!! Oil a big bowl & put dough in it. I place a closed plastic bag over it & let it sit in a warm place to double in size. This took my dough 4 hours. The dough is still wet! Use dough scraper to help you! 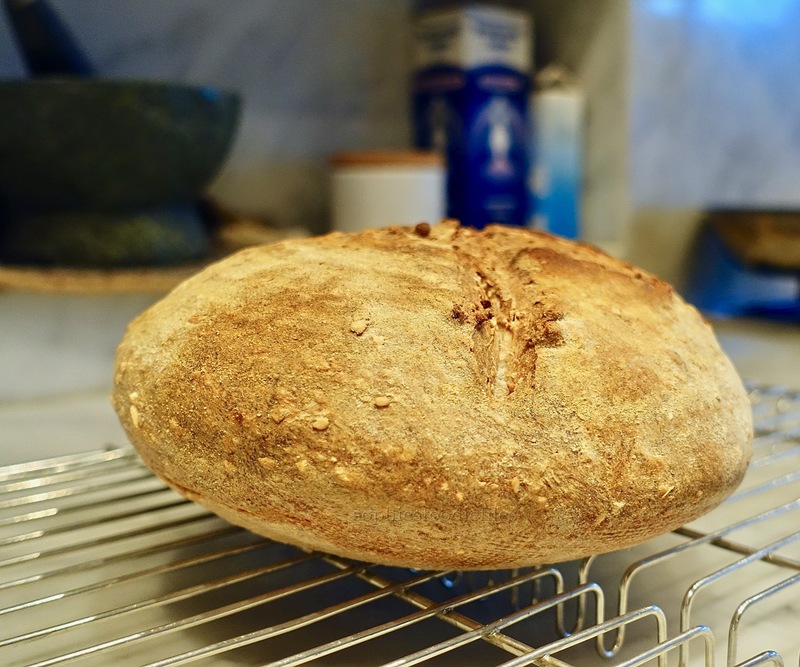 Scatter your chosen banetton with wholemeal rice flour, all over & on all sides & also onto the bottom to prevent sticking from the dough later & also to form the lovely lines on the top & sides of your bread!!! Form the dough into the shape of your banetton to fit it. Place the seam upside in your banetton. Place it again it a closed plastic bag in a warm place & let it double in size. This took my last rise 3 hours. Preheat your oven to 225°C (437 F) for 10 minutes. I also poured boiled water in a oven proof pot to create steam in your oven. Open plastic bag & place a bread silpat on your oven rack. Carefully turn your bread upside down out of your banetton in one quick movement. 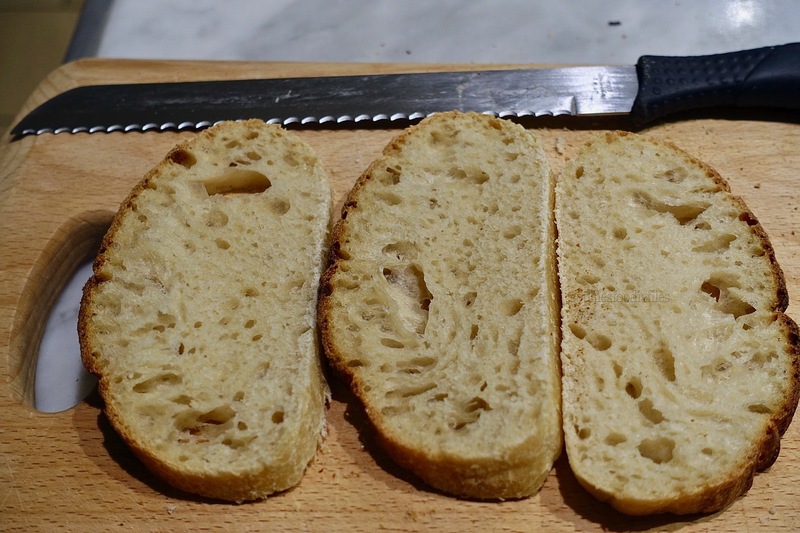 Now, your bread dough is lovely patterned on top & on the sides. Make slashed into the top of the dough, just like you want! 🙂 Place into the hot oven & bake for 35-40 minutes until browned on all sides & cooked though. Check oven often to prevent burning. Lower your oven temperature if you need to. 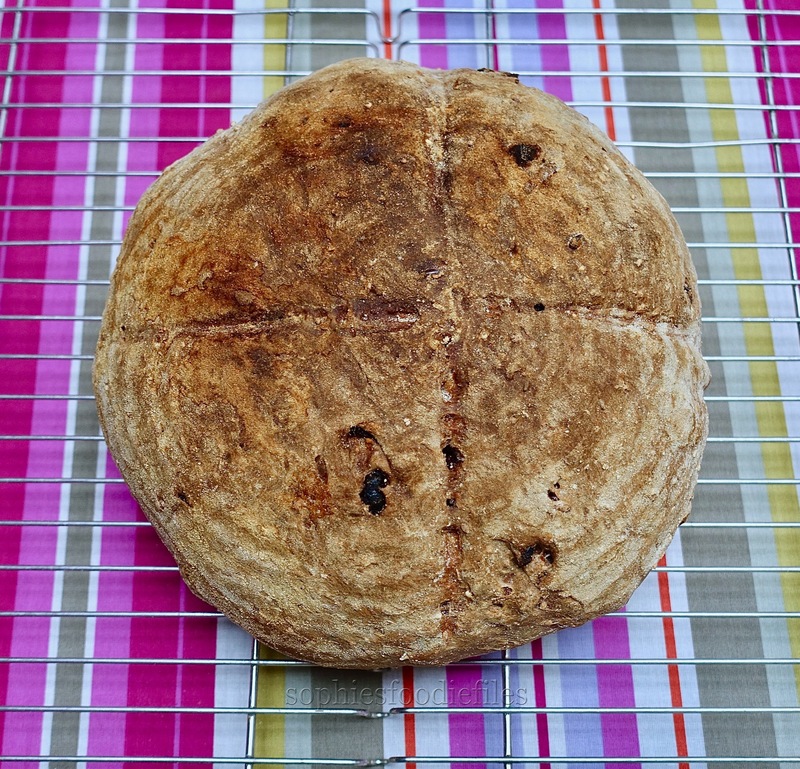 When your bread is ready, risen & golden, your house will smell absolutely amazing! My dough was 919 gr! Put onto a wire rack to, cool down completely! Slice & munch! Store in an organic bread bag! 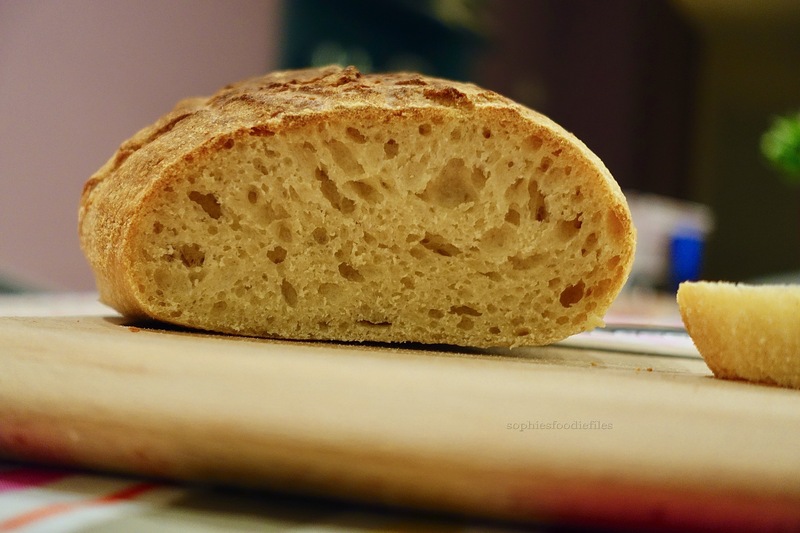 You might like these other sourdough breads! Vegan Chocolate Chip Almond Sourdough Buns! Today, I invented & made these glorious delicious chocolate chip almond sourdough buns! yes, that sounds so delicious & yummy right? Just coming from the oven! Just brushed with melted vegan butter & slashed! In the evening, make your bread mix. Take Kenwood machine & place dough hook in. In fitted bowl ad first 6 ingredients. This is the sourdough, 5-grain flour, soy milk, warm water, cane sugar, vegan milk chocolate chips & almond flakes. 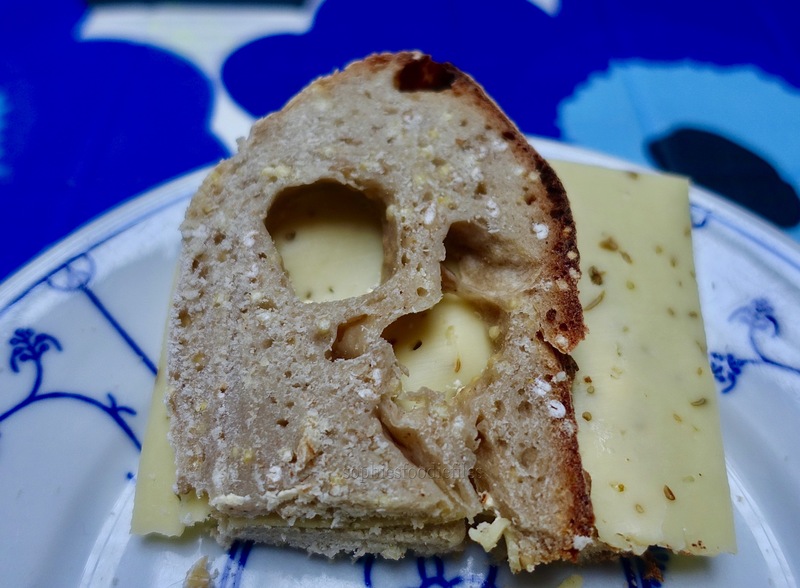 If you have a stronger aged oat sourdough, it is possible that you need to add more warm water, bit by bit,…otherwise you don’t end up with a nice sourdough, the inside will be too dry then! Start mixing on low-speed, aka number 2 for 2 minutes. Then leave the dough to rest for 20 minutes. 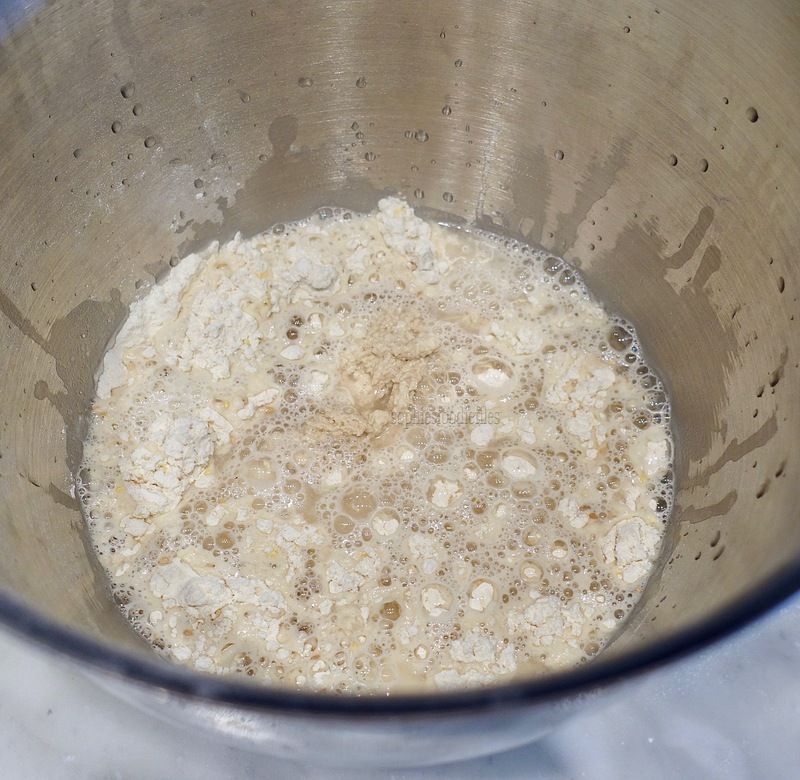 The flour is allowed to absorb the moisture = autolyse. Now, ad last 2 ingredients. This is the margarine & the salt. Start mixing again on medium-speed, aka number 3 for 5 minutes. Then, turn up to 5 & mix for 5 minutes more. 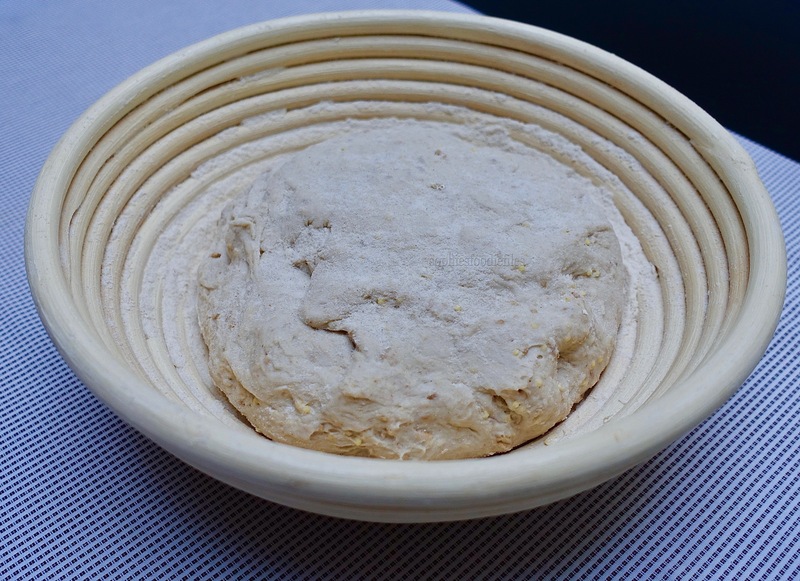 Take dough out of the bowl & place onto kitchen top. You don’t need no flour here! 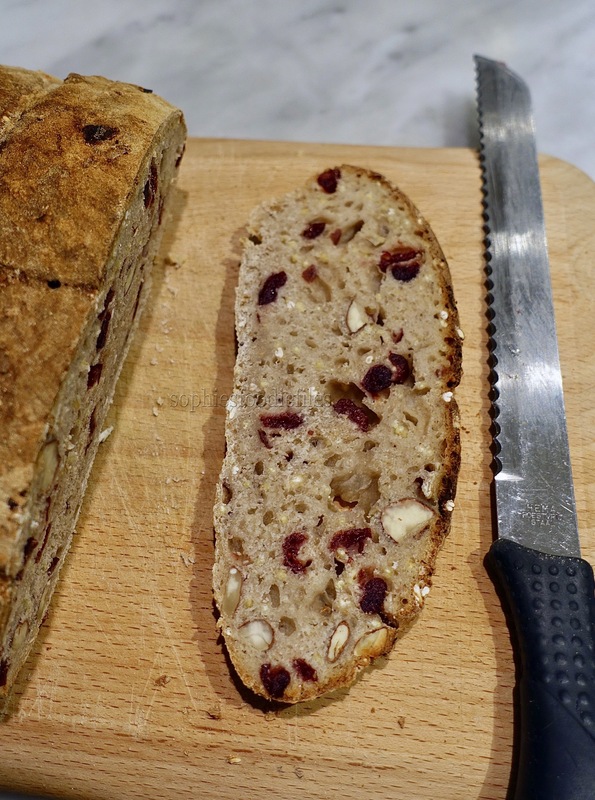 With your hands, knead for another 3 minutes, to stretchen the gluten inside! That is what we want. I do the stretch & fold principle. Then, turn the dough again! This during 15-20 minutes. Your dough has to be smooth! Shape a boule shape. Oil a big bowl & place dough in it. Place closed plastic bag over it. Leave on the kitchen counter, sitting on a big towel, to rest for 1 night. In the morning, after 8-12 hours of rising, remove plastic bag. Your dough has doubled or tripled in size! 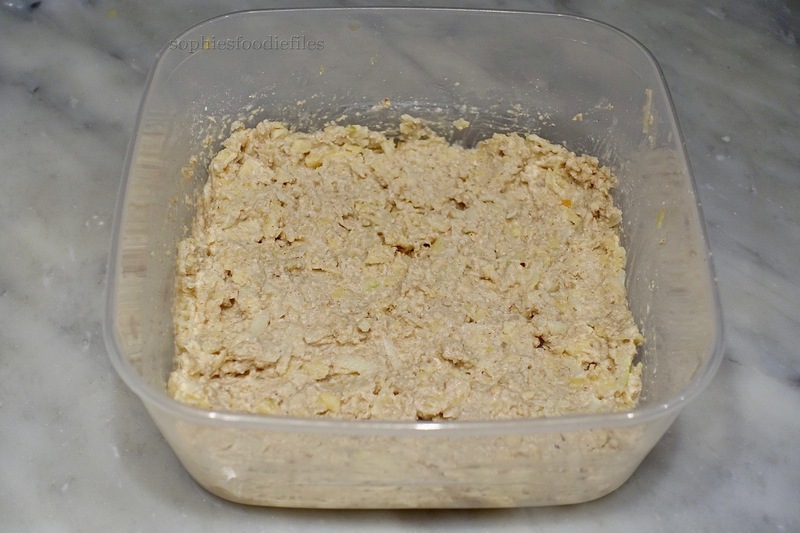 Place dough onto kitchen counter & weigh the dough. Mine was 850 gr. Divide with dough scraper into 11 equal sized & weighted portions. 850 gr divided by 11 = 77 gr each! It is easy this way. 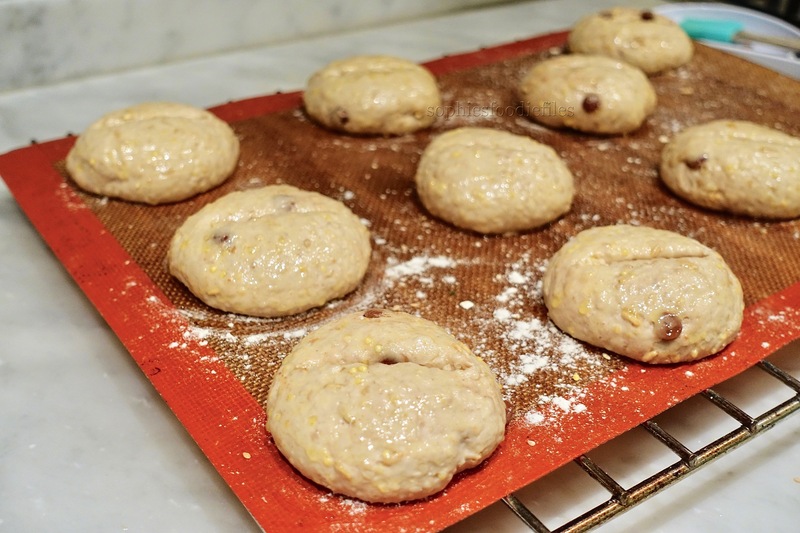 Roll each dough piece into a round ball, space them well apart onto a silicon baking sheet onto an oven rack. Take 2 oven racks to form 11 bread buns. Now, dust some 5 grain flour over the top surface of each bun to prevent sticking to the plastic bag that you are going to put over them to rise until doubled in size. This took my buns about 2-3 hours. Preheat your oven to 200 °C ( 392 F) for about 10 minutes. Melt some vegan butter. Just before placing the buns into the oven, make a slash with your dough scraper or a sharp knife in the middle of each bun & brush each bun , all over the top & sides with melted butter. Place into the hot oven & bake for about 25 minutes or until golden & baked through. Place each bun onto a wire rack to cool down completely! These buns are utterly delicious! MMM! Excellent with just some vegan butter or with vegan butter & apple/pear sirup! Like what you see & want receive my posts per email? Subscribe here & join 1,800 email subscribers! You will get my free E-book: Healthy Vegan Christmas too! When you subscribe to my blog, you will receive an email to confirm your subscription & then, you will receive a final thank you email where you can download the recipes in the format that you want.